"Al-Ġāfiqi was a physician who lived in Andalusia in 6th c. AH/12th c. AD. 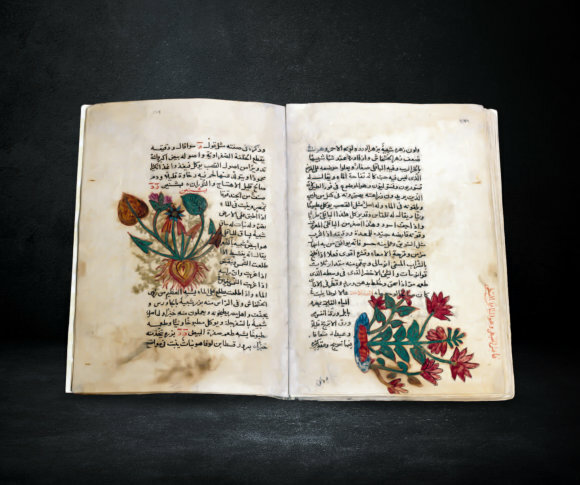 This is a scientific manuscript copied in Turkey and ornamented with scenes of plants, explaining their medical benefits, and their usage in curing. Given that it is a scientific manuscript, the copier didn’t give sufficient care to make borders to its pages; but rather focused on drawing the herbs and specify their medical usage. 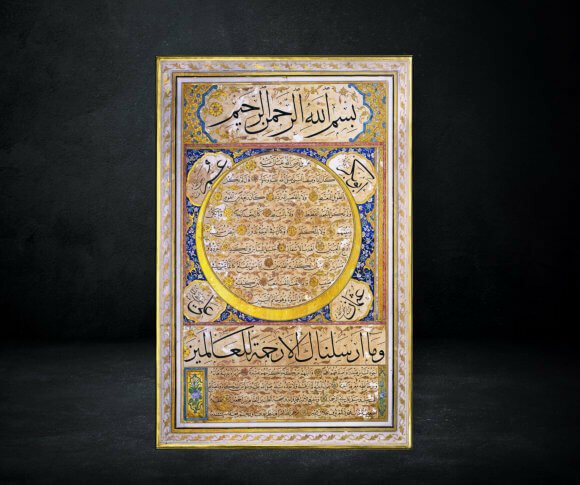 "This honored hilya is giving a description for the prophet Muhammad (PBUH) starting with the Basmalla and a rounded medallion bears the description of the Prophet Muhammad (PBUH) for his features and appearance. The names of the four rightly-guided caliphs are written then a verse from Quran (Surat al-Anbiya’ “We sent thee not, but as a Mercy for all creatures”. The conclusion covers the description of the manners of the prophet Muhammad (PBUH) and carrying the name of the writer and the date “ released and revised by Mahmud known as Galal al-Din…1223AH. 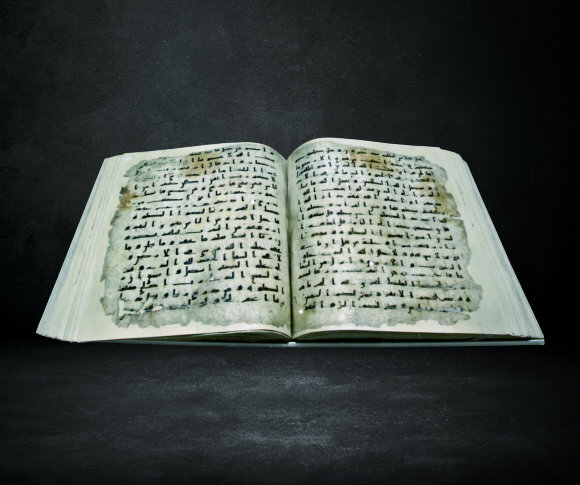 "This Quran was written on parchment using brown ink. The writer used Kufic script with diacritics and nunation characters shown as red dots accompanying the letters. 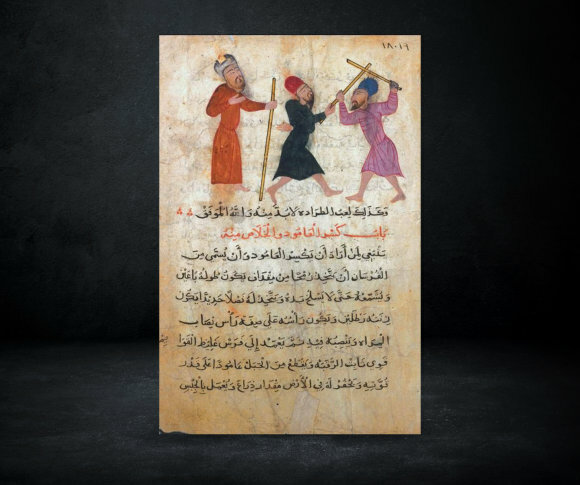 "This page, from the manuscript entitled Nihāyat al Sawl, shows two men training in stick fencing while a third, probably their trainer gives them instructions and referees their game. Such drawings reflect the type of games that were popular among the populace in those times. They also demonstrate the prowess of the drawers in capturing the garments and expressions on the faces of the players. The text on this page explains part of the rules of the game. The title at the top of the page says: “Chapter on the breaking of the stick and the disposal thereof”. "Holy Quran bearing the name of Sultan Jaqmaq. 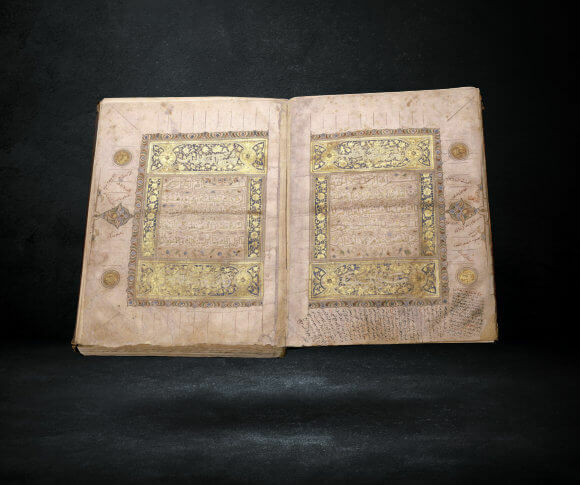 The papers of this Quran are decorated and gilded and contain exegetic explanations of the verses of the text .